The Novium Museum in Chichester is encouraging people to get their 'Game On!' for a national Museums at Night Festival this month. 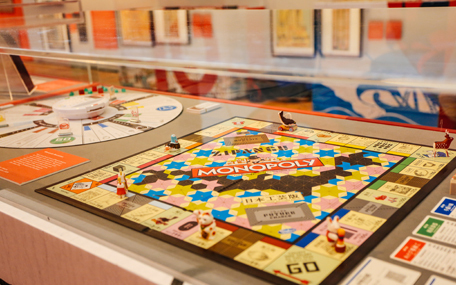 On Friday 18 May from 6pm to 9pm, guests are invited to join The Novium Museum for a vibrant evening of games and activities, surrounded by some of the most iconic, enthralling and visually striking games from the V&A's outstanding national collection of board games. Museums at Night is co-ordinated by Culture24, and seeks to encourage new audiences into museums, galleries and heritage sites by throwing their doors open after hours and putting on special evening events. Owen Lambert, Director of local gaming haven Comics, Games & Coffee Limited, will be demonstrating a number of fun, light-hearted games including Love Letter and Tumble Tree, and encouraging participants to have a go. Members of Chichester Gaming Society will become 'living exhibits', and as they settle down to play Pandemic and The Settlers of Catan, guests will be invited to observe, question, and learn the intricacies of the games by seeing them in practice. We will also be joined by Asmodee UK, the UK and Europe's leading distributor of board and card games who will demonstrate a number of fast-paced games, including Dobble, Bananagrams and Ticket to Ride. Southampton based product designer Emma May of Emmerse Studio will also be presenting her party card game Quirk! 'The ridiculously silly game for awesomely fun people'. Guests will then have the opportunity to play these games themselves. The gaming evening has been organised as part of a series to run alongside Game Plan: Board Games Rediscovered, a major touring exhibition from the V&A Museum of Childhood, open at The Novium Museum until 1 July 2018. Game Plan, which is free to visit, celebrates the joy, excitement and occasional frustration of playing board games. Councillor Eileen Lintill, Cabinet Member for Community Services at Chichester District Council, says "Game Plan has already inspired so many visitors to dig out old favourites and this event is the perfect opportunity to learn some new games. Guests will be able to get hands on with games they may not be familiar with, and the aim is to get everyone involved in gaming as a fun social activity." Tickets cost £5 per person, or £3 for students with a valid NUS card, which includes a drink on arrival. Refreshments will be available from a cash bar throughout the evening. Guests must be aged 18 or over. For further information and to book, visit The Novium Museum's website or call 01243 775888.